Last week my husband and I were in Seattle for business (and some pleasure). He had several job interviews in the area. I had planned to make a few food posts and maybe one or two posts about our journey. Well, it was a good plan, but didn't happened that way. I didn't even look at the menu . The plates rotate on the conveyor belts that winds through the restaurant, and I just picked what looked at me. Isn't it pretty?! Upon our arrival our first stop was for food. We let our daughter to choose where to go, and lucky for us Sushi Me place it was. We love fish and everything seafood, and miss having a good seafood in the South. After we made our bellies happy, we drove 65 miles North to a small town Mount Vernon, famous for it's tulip festival and several breweries. I told you about the weather, so just ignore it and enjoy! 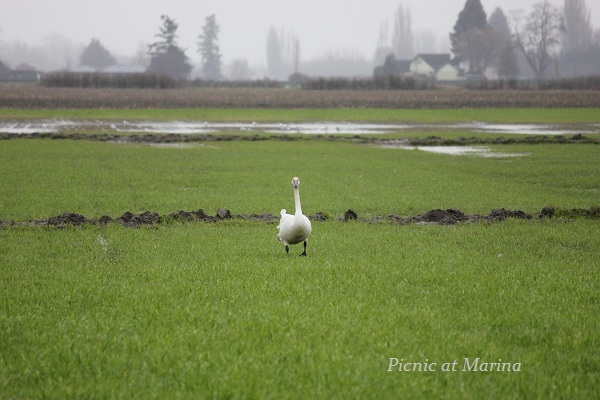 This photo is from our trip to Skagit Valley Tulip Festival in April 2010. Next day, while my husband was performing his best on the first interview, I went to a little town La Conner, one of my favorite getaway place. 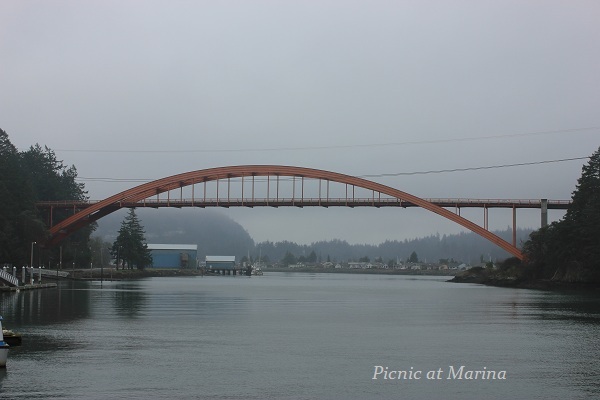 Rainbow Bridge, La Conner, WA. but someone decided to add some orange to the town's landscape. Three miles later I treated myself to a cup of tea and a slice of delicious pie. I don't remember how crust tasted, but the filling was melting in my mouth, warming up me from inside out. I didn't take picture of the pie, but this is the cafe where I had it. I strolled along town's 1st Street, entering almost each open door on my way: museums, stores, until I burned all my pie calories and was hungry for lunch. Each time I am in La Conner, I always have lunch, or dinner, or just a pie at one of my favorite places there, at Waterfront Cafe. 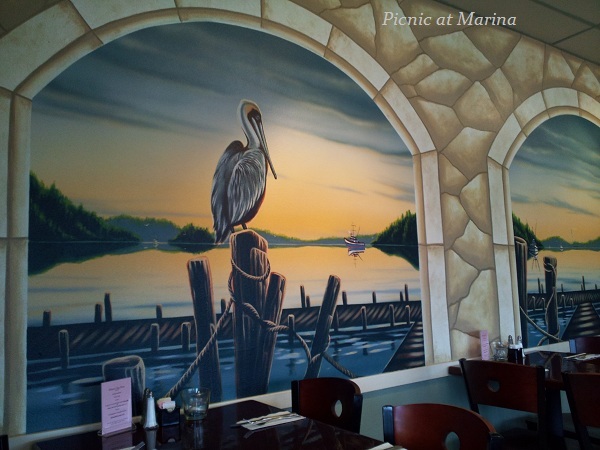 The place is small and casual, but famous for it's fresh seafood, clam chowder, and... a view at spectacular mural painted by Jerry Ragg complimented by a river side view. 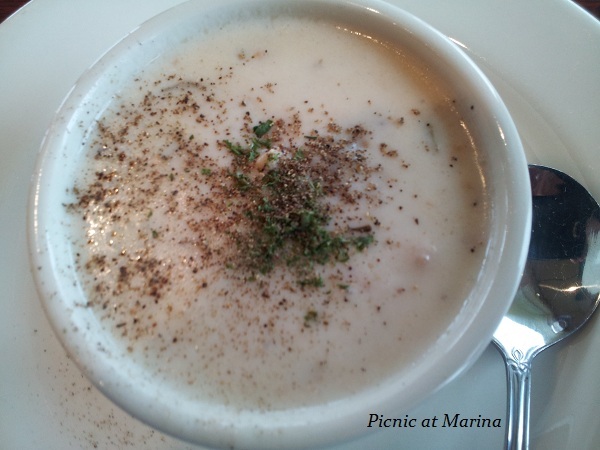 Clam Chowder - hearty New England style chowder. 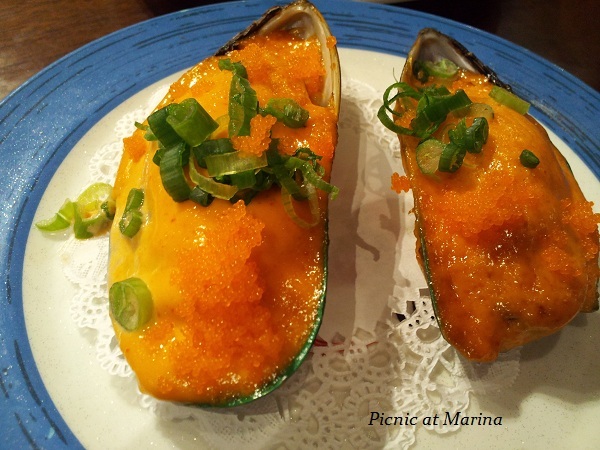 I loved it's silky texture with chunks of fresh clams and potatoes. 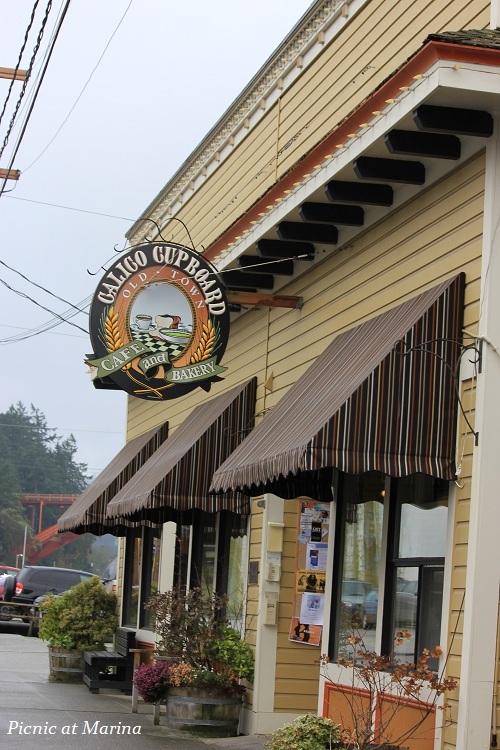 I ordered my favorites: clam chowder and Waterfront Cafe's signature dish Fish and Chips. It wasn't a rush time yet, so I enjoyed my food in quiet, immersed in a pleasant view. 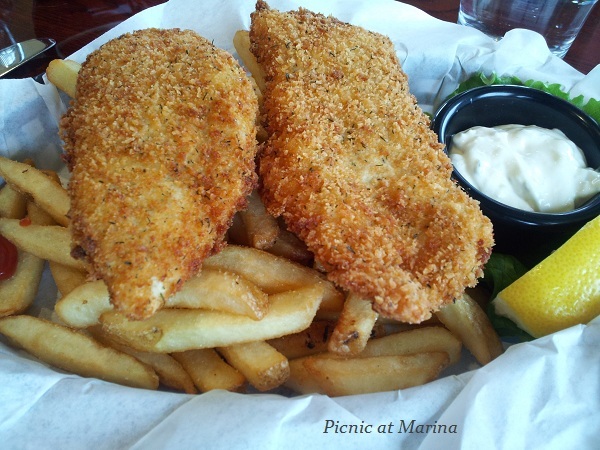 Fish and Chips, Waterfront Cafe's signature dish made with fresh Alaskan cod. Under that golden crust is perfectly cooked flaky fish. I guess they shake off the breading before frying as it has just enough of it to make a crust, but doesn't leave you wandering what was it: fish in bread crumbs or bread crumbs with slight flavor of old fish. Here it is definitely the most delicate fish enveloped in light crust. Here's whom I met along my run. This birds didn't even notice me or any other moving object like other runners, bikers and cars. I left La Conner refreshed, re-energized, and emotionally re-charged. I was glad I was able to squeeze this de-tour in our hectic schedule. P.S. All the meals were payed out of my own pocket. Sounds like you had a lovely time. Good luck to your husband on his interviews! The Pacific Northwest is lovely, and we thought seriously about moving to Portland in the early 1990s; but decided we needed a bit less gloom in the winter. OK, a lot less gloom! It's really nice in Washington and Oregon, though, and there's some wonderful eating in that part of the world. I did have some moments during our trip even though my husband had four interviews in four days, and each day we traveled from one hotel to another, seeing family and friends on the way. I didn't have my camera with me most of the time, but I did manage to take some pictures. Sounds like a wonderful time! I love the tulip pictures with the mountains in the background .. sigh. Hi Jane, those are the small mountains. The big and pretty hide behind the clouds. I'll have to go back there in a good weather day and take some more photos. :) Thanks for your comment! What a wonderful trip. Your pictures are just lovely. They made me long to travel (and eat some really good food!) Thank you for sharing another dose of inspiration. I hope you are having a great week and are staying warm. The food is as beautiful as the tulips are! It looks like a wonderful trip, and I loved reading about your side trip to the small town. Beautiful pictures Marina, and I am so glad that you had a enjoyable trip...thank you so much for the pictures, many of them brought me memories of my trip to Seattle. Love your pictures... tulips, birds, sushis!!! Lovely! Well, Lorraine, you are a professional traveler, I an amateur. :) I was thinking of you a lot while in Seattle: how do you do what you do on your blog during your trips? I opened my computer only once even though I planned to make a few posts. I deeply admire what you do, your patience and dedication. Thank you BAM! He is working on that. Those tulips are from 2010, it was too early for tulips to bloom in February. Marina, such a beautiful post you have have, we missed you very much but I am so happy that you had a good time. 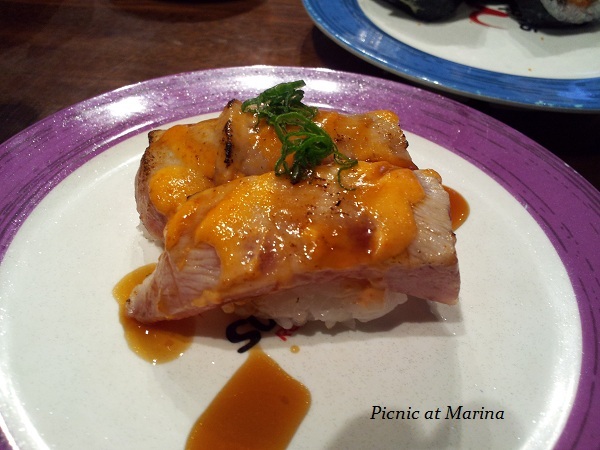 I love seafood, and I am glad that you had plenty-))) Welcome back my dear Marina! Thank you Alena! I missed you too! Oh yes, I had all seafood I could during our trip. There's no way to get such fresh variety of fish in our parts of the country. What a fun trip for you...glad you got to work in some "you" time. Gosh, who knew tulips blossomed so early near Seattle...hope spring arrives here SOON. I've been to a sushi spot with a conveyer belt in Seattle...I was with my sisters and we had a blast!!! Thanks Liz! Oh no, when we were there tulips just started to show above the ground. 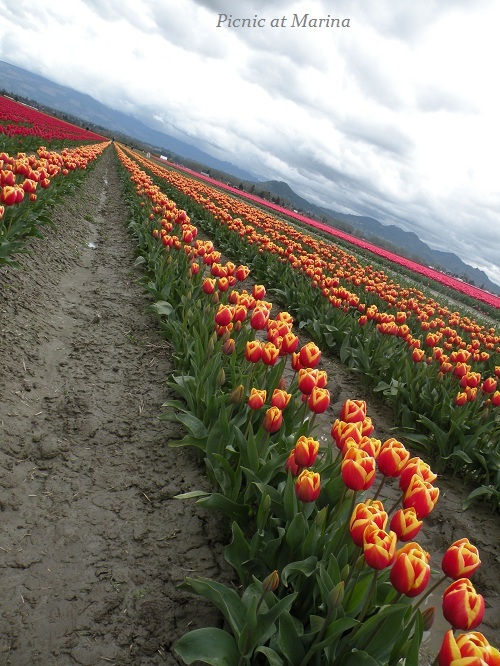 Those photos are from April 2010, when they have tulip festival. I like the conveyor belt idea, you can see what it is instead of just reading about it. Your food photos are making me sooooo hungry. Glad you are having a good time. Good Luck to your husband with his job interviews. Thank you Norma. We had quite busy trip, traveling from one town to another, where he had interview every day. It was intensive I shell say. We managed though. What a fantastic fun time--Seattle's such a fun place to be. 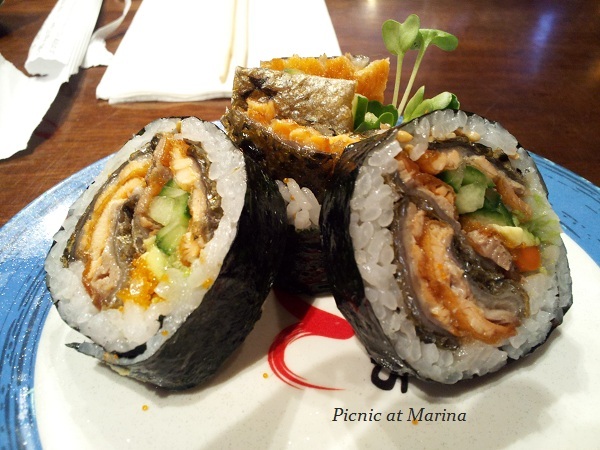 That sushi looks divine and has got me drooling, but it's your descriptions that have me yearning for a good vacation! I love the picture of the rows of tulips, so beautiful... I would have loved a picture of the tart!!! YUM, I am getting hungry now. I mentioned to you earlier, Marina, that I would have loved traveling with you. Your post is further proof. All of that seafood! I would have so enjoyed each of the dishes you've photographed and mentioned. You must have been in heaven! I do hope your Husband's interviews went well and your find a home that your family all loves and is excited about. Just loved browsing through each and every photo of your pleasure trip...would have loved to tag along! 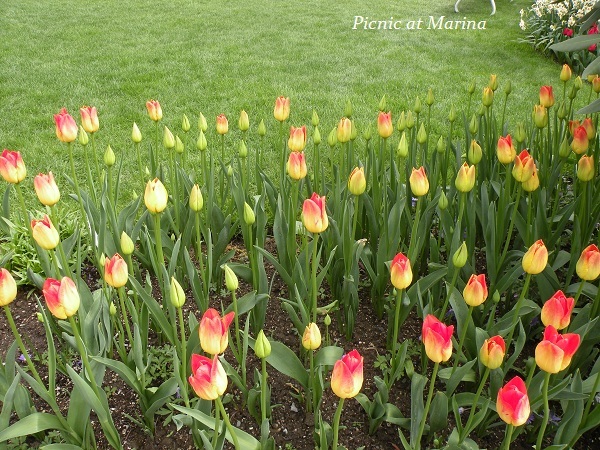 Such gorgeous view...beautiful scenery, the tulip garden is spectacular~ the fish and chips to "die for" the clam chowder...my, oh, my...getting so hungry now. The cafe is so very charming, I can picture myself sitting there, chatting with you with a nice cup of coffee and a favorite slice of pie! Now, that's what my idea is of a fun day!...simple, and nice n'easy! What a lovely trip you had? 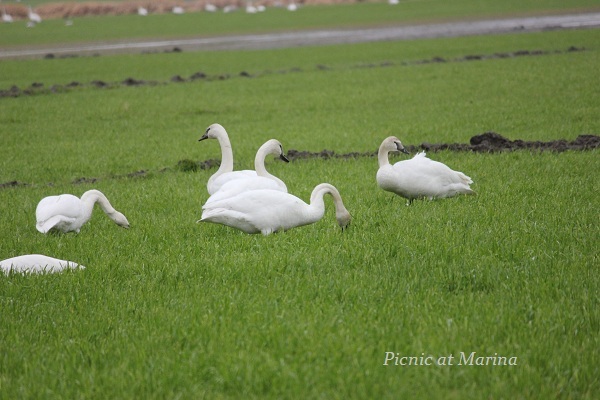 Yummy food and gorgeous field. I love that never ending field of tulips, my favorite flower by the way. Wish I can have a trip there too.